Over the weekend, I made a pot of--my version--of chile verde. In my family, our friend Bryce sets the standard for chile verde. ("Yours isn't even green!" they say.) Maybe someday Bryce will post his recipe, but in the meantime, this recipe is one that never fails for me. Everyone seems to really like it and it's pretty simple. I've tried to make chile verde using pasilla, anaheim & jalapeno chiles--roasting the chiles & tomatillos, and pureeing them to a pretty green color. It turns out too hot for some family members, so I end up going back to this recipe every time. It's a lot simpler, too. Trim off as much fat as you can, then cut the meat into cubes. The pork country-style boneless ribs they have at Costco work well for this recipe too. I use that often. Add the meat to a hot pot. It should be hot enough that the meat sizzles when you add it. After you add the meat, let it sear for several minutes before you try and stir it, then it won't stick. Put the bone, if any, in the pot also. Add about 4 cloves of garlic that you've coarsely chopped. You don't have to add any water, the meat will start to release liquid. And add them to the pot along with the can of diced green chiles. Stir the onions and green chiles into the meat. By now the meat will have released it's juices and it will be easy to stir. Next, add the liquid from the cans of tomato to the pot. You could simply add the whole can, as-is, but I like to give them a rough chop. If I'm in a hurry, I puree them in the Magic Bullet. Or, you could buy pureed tomatoes. During the summer, I use fresh homegrown tomatoes. Stir in the tomatoes & add 1 teaspoon dried oregano. And, if you are so inclined, add a beer (about half) or some wine (about a quarter cup) to the pot. It gives the mixture a really good flavor. Bring mixture to a boil and simmer on low heat, uncovered, for two hours, or until the meat is tender. Skim off any fat that pools at the surface. Taste the broth and adjust the seasoning with salt & pepper. 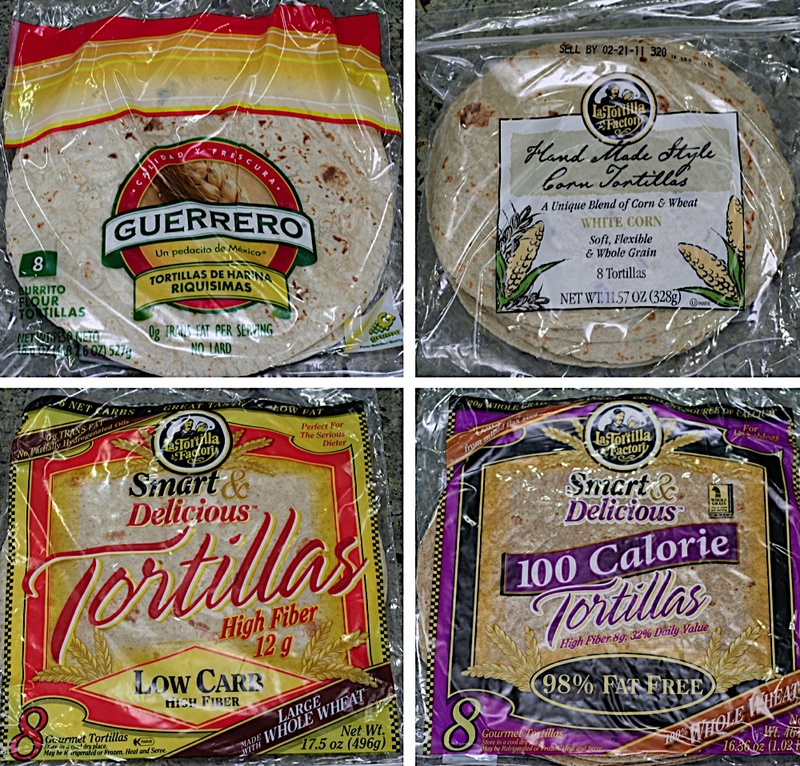 I bought these tortillas to serve with the meal. 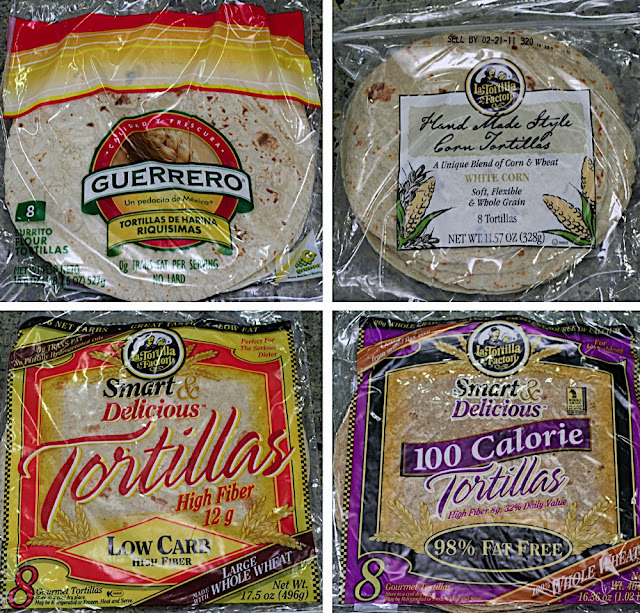 The corn tortillas went first, then the Guerrero plain white. We had some of the 'healthy' ones left. Myself, I like the healthy ones. 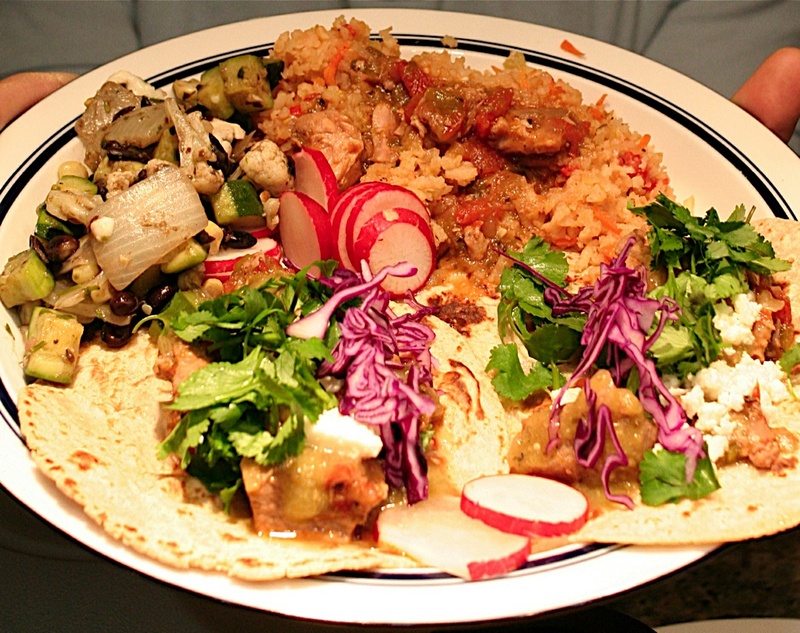 Spanish rice with a scoop of the chile verde on top, two corn soft tacos with the chile verde topped with cilantro & red cabbage, sliced radishes and black bean & vegetable medley. Laura made the rice and vegetable medley. Thanks, Laura, for making the vegetarian side dishes. Everyone enjoyed them! This isn't my plate, but I had a burrito with rice & veggie medley, cilantro & red cabbage, and queso fresco. Serve the meal with a bowl of fresh chopped jalapenos on the side for those that love heat! Laura made this DEE-licious King's Hawaiian Bread Pudding. It was really good. I snuck a taste from the corner of the pan before dinner, so I knew to save room. You can find the recipe online. And I made a flan. Directions and photos to be posted later this week! Ooooh, Daniel and I are drooling over your taco plate! Awesome presentation once again!